Between 230 and 221 B.C., the ambitious and extremely young king of Qin, Ying Zheng, unified China, adding all the other so-called Warring States (ZhanGuo) to his empire. 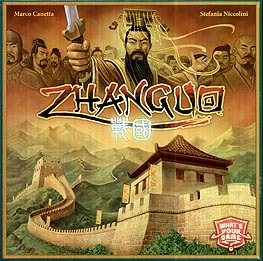 Each round of the game, you will need to make the best of the cards you get: You can play each card either on your own player board to contribute to the unification of the Empire and to increase your personal power, or on the gameboard to recruit manpower, construct the palaces the emperor desire, assign officials, install governors, and help build the Great Wall. Each player has to choose the best time and best way to play his cards in order to earn the emperor's favours. Be careful, though, because trying to get too much power, or exploiting the workers for personal gain could increase dissatisfaction among the populace, and conse1quently increase the risk of uprisings in the newly annexed regions. Whoever is able to make the greatest overall contribution to the emperor's cause, while at the same time keeping the citizens placid, will be the winner.